One of the top beauty secrets that I've picked up over the years is using Royal Jelly for better skin health. Taken internally, royal jelly works like an internal cosmetic and externally it is used in many cosmetic products. A recent study has shown that royal actually increases the moisture content of the skin which in turn helps treat dry, damaged skin. The study's participants experienced an increase of 28.8% and 60.4% on the hydration index after just 7 and 21 days of treatment with a cream containing 10-HDA. 10-HDA is the ingredient in royal jelly thought to be so beneficial for skin health. The study also revealed that royal jelly promoted new skin growth. Royal Jelly is known to regenerate the cells and tissues and even treat dermatitis. The skin can renew itself in 30 days so if you use royal jelly for your skin, you should begin to notice a significant difference in healthy, new skin after roughly a month. But the trick is to use it consistently. With increasing age, the skin's cell renewal process becomes less efficient. Tissue repair and cell regeneration slow down. The amount of natural moisture present in the skin is reduced. Because collagen production is less, the skin becomes thinner and loses its flexibility. If you can boost collagen production, you should be able to slow down the aging process. Royal Jelly contains minerals like silicon that lead to increased collagen production. It also contains specific anti-oxidants and nutrients that support skin renewal such as flavonoids, nucleic acid, decanoic acid, enzymes, and hormones. Numerous vitamins and minerals such as B1, B2, B3, B5, B6, acetyl-choline and zinc can be found in royal jelly which are excellent for skin health. Studies indicate that the acids found in Royal Jelly contribute to its collagen production and promotion. For those who overwork and overstress, your skin and hair will eventually show it. You may have frizzy hair and your skin may end up dull and lifeless. Your adrenals and kidneys are working overtime when you continuously work like the 'energizer bunny.' They need rest in order to regenerate and recover. In Chinese medicine, the kidneys represent strength. When the kidneys are weak, the hair loses its luster, the skin sags and the body retains water. Royal Jelly just so happens to be a tonic for the kidneys. “The kidneys bloom in the hair”, say the ancient Chinese texts. Hair symbolizes strength; he who is scared has his hair standing on end. Royal jelly will help you love your kidneys and adrenals. Give your body what it needs and your skin will thank you! 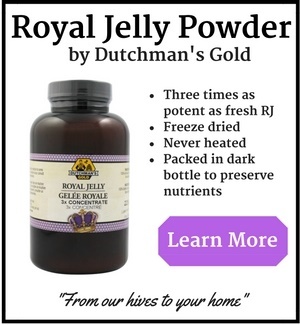 During periods of intense stress, work up to three 1000 mg capsules per day of freeze dried royal jelly. Sun exposure is needed for healthy, glowing skin. Too much sun is not and as we all know can lead to accelerated skin aging. With royal jelly's skin benefits becoming more well known, scientists set out to investigate if royal jelly could protect human skin cells from photo-aging (aging caused by the sun). In this study, scientists tested the effects of Royal Jelly on UVB (these are the "burning rays" of the sun that are the primary cause of accelerated skin aging). Basically, they applied Royal Jelly to the cells and then set about giving them a sunburn. What they found was that the cells treated with Royal Jelly and 10-HDA had increased procollagen type I production indicating royal jelly caused an increase in healthy, new skin cells to be produced. When there is a hormonal imbalance or specifically during menopause a decrease in hormones often causes skin problems. Low estrogen creates significant changes in the skin. Menopause also causes a reduction in the level of testosterone but not as significant a drop as in estrogen. Royal Jelly is a powerful hormonal tonic. Because your hormones are so complex, royal jelly should be used for a minimum of 3 months to see hormonal balancing. Hair will thin after menopause. In some women, genetic factors produce significant thinning. Abnormalities in the level of a thyroid hormone, in addition to the amount of iron stored in the body, can influence the volume of hair. I highly recommend using a product called ThyroSmart if this is what you are experiencing. Estrogen encourages hair to stay in its growing phase (Anagen hair). This is seen in the significant thickening of hair towards the end of pregnancy. After menopause, however, the lower estrogen amount allows the scalp hair to grow towards the falling out stage (Telogen hair). Royal Jelly is used in case of ovarian insufficiency and with the troubles of menopause. It also balances hormones and promotes healthy hormone production. According to ancient teachings Royal Jelly works to preserve life and strength in the organism, which delays the aging process and retains the elasticity of the mind, psychic buoyancy, and the youthful physical freshness of the body for as long as possible! 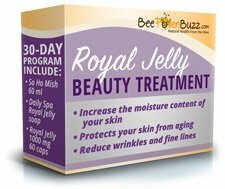 To incorporate royal jelly into your skin health program, give my Royal Jelly Beauty Treatment a try for 30 full days. Not only will your skin take on a healthy, blemish free glow, but as your collagen levels begin to increase you'll experience tighter, firmer skin and the renewed sense of confidence that accompanies better skin health. 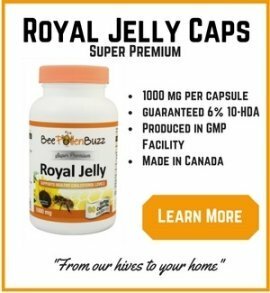 Royal Jelly Capsules: Take two or three 1000 mg capsules per day as an 'internal cosmetic.' Remember that your skin is an organ and should be cared for internally as well as topically. Start with one capsule per day for one week and then increase only after tolerating well. Royal Jelly Skin Cream: Replace your current moisturizer with a royal jelly based cream. 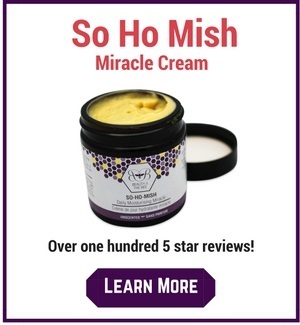 I use and highly recommend the So Ho Mish Miracle Cream which contains royal jelly. Apply it twice daily. Royal Jelly Soap: Most of your soaps will contain chemicals and abrasive substances that will actually dry and damage your skin. Use a soap that is 100% natural and contains royal jelly along with other skin health boosting nutrients like natural beeswax and honey. I use and recommend Beauty and the Bee's Daily Spa with Royal Jelly soap. BONUS TIP: If you have access to it, consider applying a Raw Royal Jelly facial once a week. 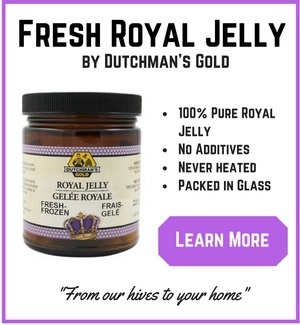 You'll need fresh royal jelly. Thaw it and then apply the jelly like substance to your entire face. Let it soothe and heal your skin for 30 minutes before removing with warm water. One bar of Beauty and the Bee Daily Spa with Royal Jelly soap. There is an option with the Fresh Royal Jelly 50 ml I used in the video for my facial mask. 30 Day Supply.